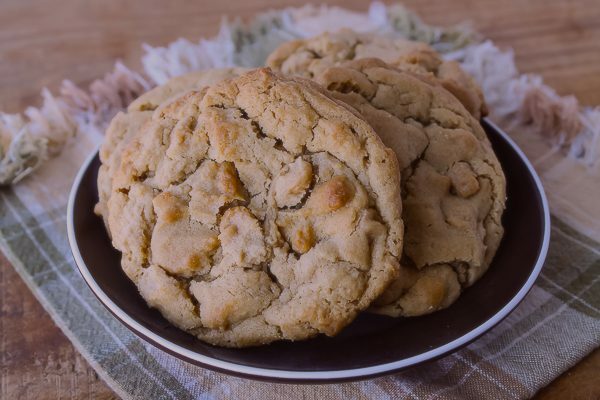 Since today, March 1st, marks National Peanut Butter Lover’s Day, my guess is you will be able to find thousands of peanut butter cookie recipes in cookbooks and online. I’m throwing this one in the mix because they are so darn good. The cookies are soft in the middle with slightly crispy edges, and rather large which is how my husband Bill likes them. 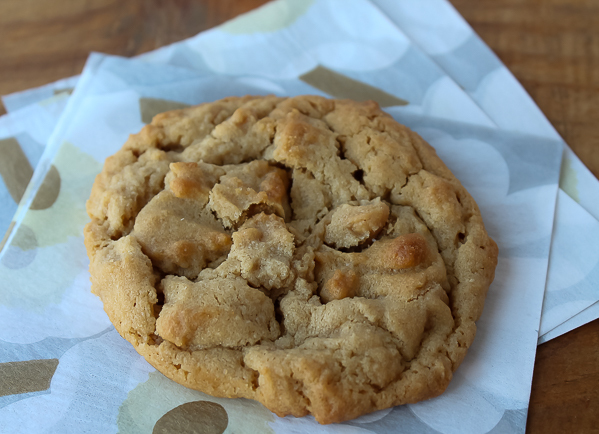 Not only is there peanut butter in the dough, but also peanut butter chips. I have had this recipe so long, I don’t even remember where I found it. It has been in my old and stuffed kitchen recipe box for years, handwritten by me, and now yellowed and very smudgy with dough-covered fingers. I don’t know if I copied it from someone, or a book or magazine. Wherever I found it all those years ago, thank you whoever you are. They are amazing. Use only softened stick real butter in the recipe, but it’s your choice if you want to use creamy or crunchy peanut butter. I prefer the creamy myself. 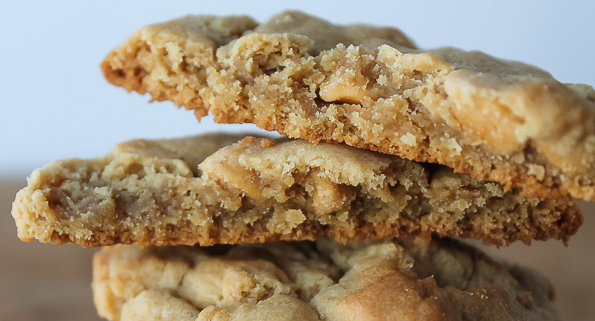 Natural-type or freshly ground peanut butter does not work in these cookies. So if you are feeling indulgent today and love peanut butter, make these for your favorite cookie monster. In large bowl of electric mixer, cream butter, peanut butter, and sugars together until fluffy. Beat in eggs, one at a time, until blended. Combine flour and baking soda and add to mixture. Beat just until mixed. Stir in peanut butter chips. At this point you can make the cookies immediately, or chill in the refrigerator, covered, until ready to use. I like chilling the dough a couple hours. Drop dough by level ¼-cup measuring cups onto prepared cookie sheets, about 3-inches apart. Bake at 350 degrees for 15 to 17 minutes, or until the edges are golden. It's okay if the centers seem a little soft. Remove from oven and let cookies rest on the sheet for a couple minutes before transferring to wire racks to cool. Makes around 32 cookies. I printed this recipe out! If I make it, I will halve the recipe. It sounds yummy! I’ve never tried to make half the amount because my husband would revolt! It might just be easier to make 2/3 given the measurements. This one looks great! The one I’ve been using lately is Cooks’ Illustrated Super Nutty — the one with the ground peanuts. Sounds good with ground peanuts, Anna!